The Grumpy Ecologist: Can a Corophium make a spooner randy? Top: arriving at Havergate, Middle: Corophium volutator, Lower: a pair of smug post-breeding Spoonbills. A break from ecological desk-work saw us discussing Spoonbills on Havergate Island. Havergate Island is one of my favourite sites, always with something to see. The island has hosted the largest UK gathering of Spoonbills for several years, with 15 present at the moment, down from the peak of 19 this year, but with up to 26 in recent years. The recent news that Spoonbills have bred in Norfolk was a bit of a blow. Personally, I’m gutted. We have been trying for years to get them to breed on the island. As in many species, when it comes to breeding, it appears that food is the key limiting resource. 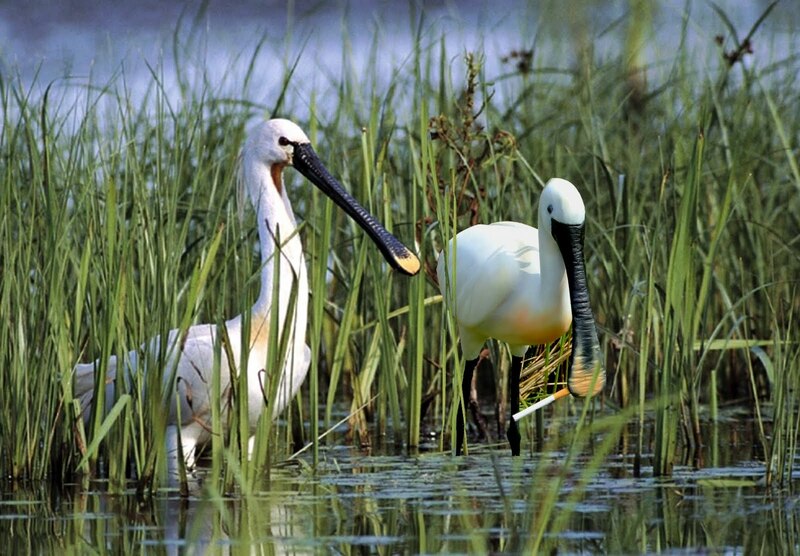 Spoonbills breed when their primary prey reaches abundance. Food intake is determined by the catch frequency and increasing prey weight increases the food intake rate but..... the average catch frequency decreases with prey size. With me so far? A Spoonbill can sweep and catch up to 20 food items a minute, but at this rate the items will be small (such as the small crustacean Corophium), enough to keep a Spoonbill going but not enough to bring it into breeding condition. However, Sticklebacks ‘running’ from the sea into estuaries or lagoons in spring to breed are a different matter. Spring Sticklebacks have a high calorific value – they are nice and fatty. Catching one or two of these a minute is better for a Spoonbill than sweeping at full rate to catch 20 small food items. Sticklebacks migrating from the sea to breed are a key food item for returning Spoonbills in The Netherlands. Shrimps, especially Palaemonetes varians are also a favoured food item, but they only reach a reasonable size later in the season. The strategy at Havergate has been to try and maximise the primary food resource for the returning adults in April. Oh well, perhaps next year.